The aptly-named jewel in San Diego's crown, La Jolla is a stunning seaside resort, offering beautiful views of the Pacific Ocean and a whole host of attractions, activities, and reasons to visit. Kayaking in La Jolla is a wonderful way to truly appreciate the full splendor of this super spot, enjoying ocean views, wildlife encounters and even cave explorations alongside your friends and family. La Jolla Kayak and Everyday California are two of the key kayaking companies you can choose to book with if you're interested in taking part in a La Jolla kayak tour yourself. There are all sorts of tour options available from early morning cave explorations to sunset paddles along the shore. The great thing about choosing a La Jolla kayak tour is that you’ll be guided along every step of the way by friendly, trained and certified instructors. These people spend hours and hours out on the water every single day; they know all of the special spots and prettiest kayaking routes of La Jolla, as well as being veritable encyclopedias of knowledge on the area and local wildlife. They’ll have the answers to any questions you might want to ask, as well as providing valuable kayaking introductory lessons, going over all the basics and safety notes to make sure that every visitor is fully safe and comfortable during the entire tour. Renting kayaks is possible in and around La Jolla for your own adventures, but tours can often be more secure and more fun too. La Jolla Kayak Tours is one of the top rated kayak companies in the area, offering a wide and varied selection of kayaking tours all around La Jolla. One of this operator's most popular tours takes visitors on an exciting paddling expedition around the La Jolla sea caves, offering close encounters with sea lions, leopard sharks, kelp beds, and more. Certified guides lead the way as groups spend around two hours weaving in and out of the various rock and cave formations. There's no better way to enjoy these caves, and it's no surprise that these tours are often booked up far in advance. This company also runs sunset kayak tours along the coastline, as well as combination kayak tours involving other activities like cycling and snorkeling. So if you're interested in kayaking around La Jolla and also want to enjoy some other fun outdoor activities, this is a super company to choose. Most tours are available for kids aged 6 and above and last for a couple of hours in total. Whale watching kayak tours are also available, giving visitors a once-in-a-lifetime opportunity to see beautiful gray whales out in the wild. Every year, thousands of these whales pass through the California waters and La Jolla is a super spot to see them in action. Everyday California is another great kayaking company operating in La Jolla and providing a super selection of kayaking tours in this stunning spot. With thousands of satisfied customers and a super rating on all major tourist attraction sites, Everyday California is a kayaking company you can trust, staffed by experienced and friendly guides who are always eager to teach people about the local marine life and geology. One of the most popular kayaking tours from this operator is the Original La Jolla Kayak Tour. 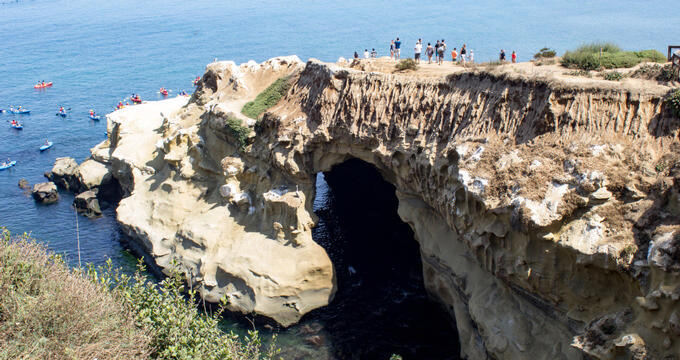 Running for 90 minutes and available for ages 6 and above, this tour provides the full La Jolla experience, including a trip around Emerald Cave and some up-close encounters with sea lions and orange garibaldi. Like La Jolla Kayak Tours, Everyday California also offers kayaking tours that also include opportunities to dive and snorkel, marveling at the marine ecosystems up and down the shoreline. Turtles, dolphins, rays, fish, and more can all be spotted both from in the kayak and under the water's surface, making these tours highly popular with animal lovers and wildlife enthusiasts. Whale watching tours are also offered by this company too. The gray whales can be seen around the La Jolla area from November through to March, and Everyday California can boast of several successive expeditions in the past, granting guests a truly special chance to get some incredible up-close views of these majestic creatures. In short, if you're looking for a super kayaking experience in La Jolla, all you need to do is sign up for one of these awesome tours. Wonderful experiences and magical memories are guaranteed every time.